Marlon Gobel Spring/Summer 2014: "We Built This City With Diamonds And Gold"
It is a huge treat to be able to see a menswear fashion show (I love seeing clothes that I can actually wear) during the mostly womenswear dominated Fashion Week in New York City. 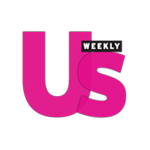 ﻿It is an extra special treat when the menswear show that you see if for one of your favorite menswear designers; that exactly what I got to do last week! I was beyond honored when Marlon Gobel personally asked me to attend his Spring/Summer 2014 fashion show. I have been a huge fan of his for many seasons and I love his innovative way of looking at clothes for men and making them unique and different. Marlon can take a blazer, a shirt or even a bow tie and put a special twist on the garment to make it unique and thrilling to the eye. 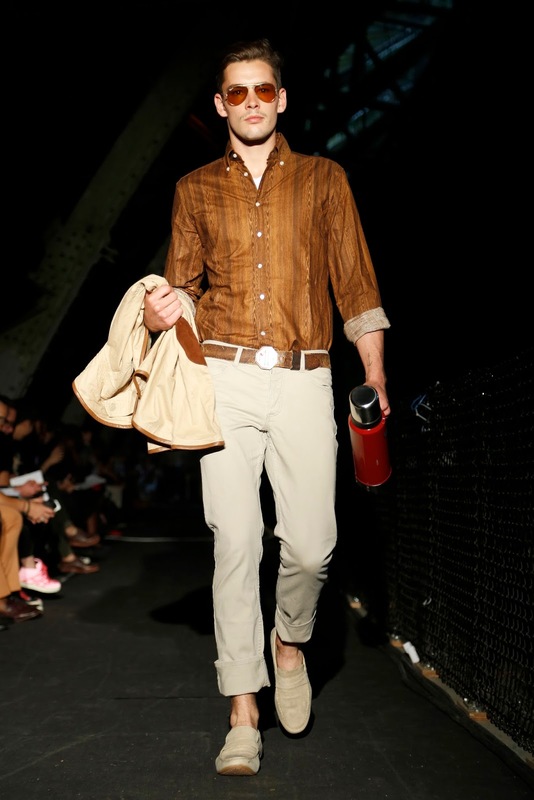 Let's check out some of my favorite looks from Marlon Gobel's Spring/Summer 2014 fashion show! 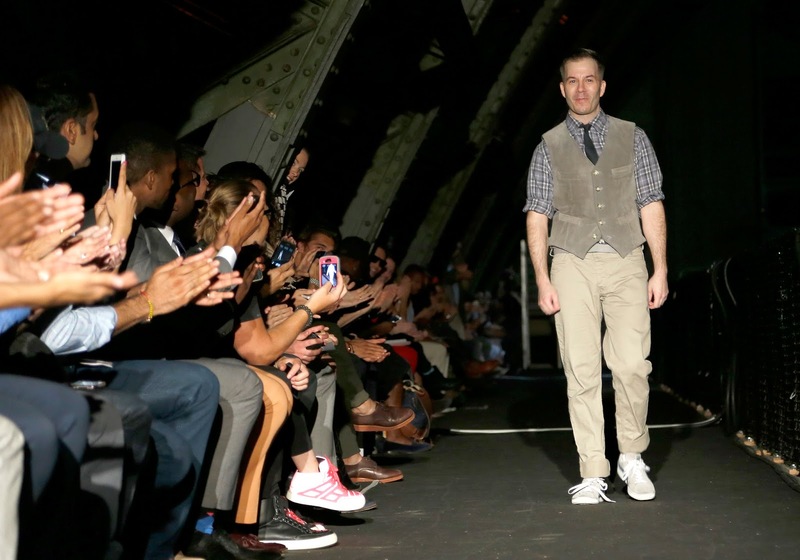 Marlon's Spring/Summer 2014 theme was "We Built This City." The invitation looked like a blue print for the Park Avenue Armory and the show was held in the Park Avenue Amory's rafters. I love when designers have a them and stick to it. It is so amazing to cover a show that provides you with a unique experience. Marlon's first look matched the theme well. 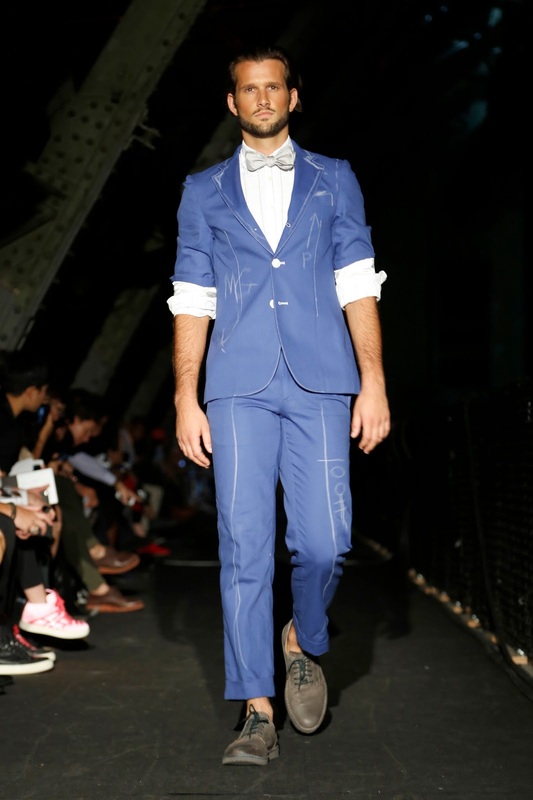 I am obsessed with this suite that looks like a blueprint as well as markings from a tailor. It is chic and fun. I am also a huge fan right now of rolling up suit jacket sleeves. I have been doing it all summer and it looks like this will be a big trend again for 2014. Rolling up the sleeves on a look like this keep you cool while still looking dapper. I love how Marlon incorporated the bungee cords as belts to go with his industrial theme. Marlon always pays attention to the subtle details and that is one of the reasons why I love his design aesthetic. This look is me one hundred percent! Note the orange bow tie! This yellow blazer is perfect for spring in the city! 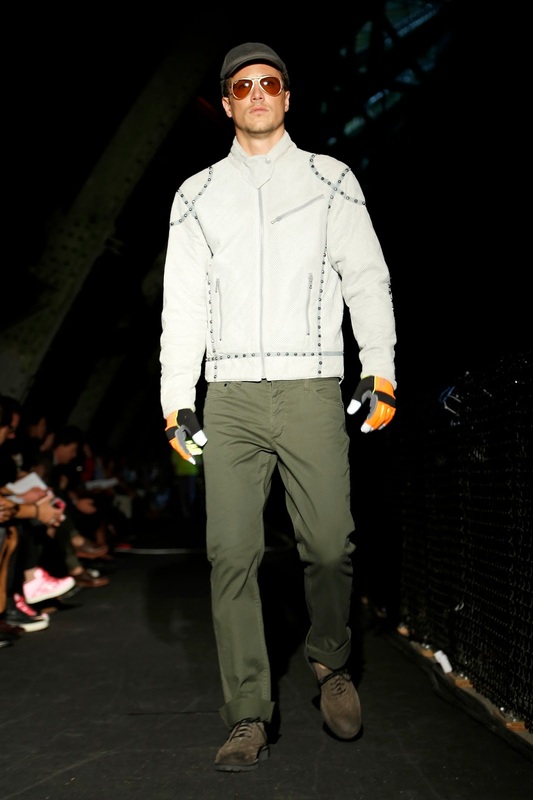 The way that Marlon accessorized this look with gloves reminds me of the dapper dudes that ride around NYC on their bikes. I am sure Bill Cunningham would love to shoot this look on the move! This jacket reminds me of rivets on a steel beam. 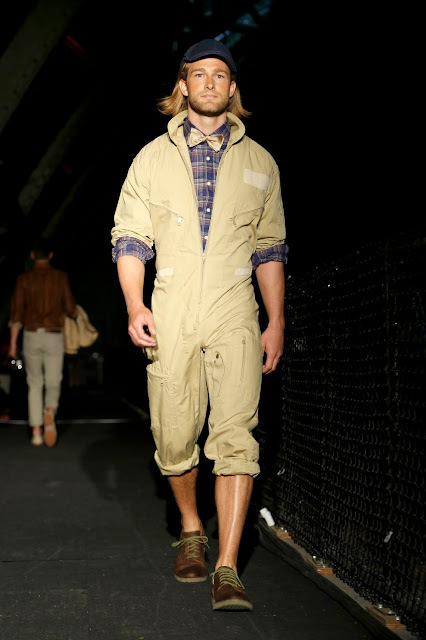 It is very industrial and adds a rugged look to any man's outfit. I would love to see this paired with a bow tie for a fun contrast. I am obsessed with this button down shirt that looks like wood. I love when Marlon does innovatie prints and fabrics and I am also a big fan of unique ways to wear brown. I love this look so much! I loved the fact that Marlon thought to put a dapper shirt and bowtie together with worker overalls. As soon as a saw it I was like, "Hmm, where could I wear this look?" It was a fab aesthetic for this show and collection! 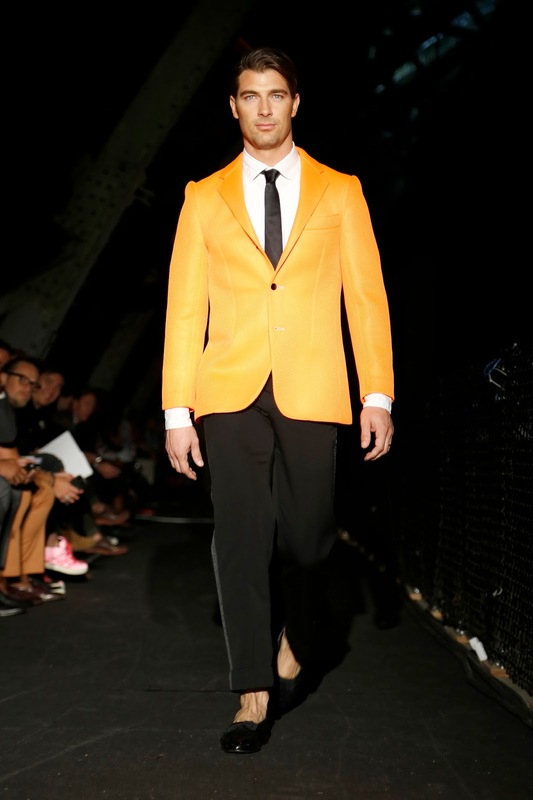 This bright orange blazer is Marlon's homage to OJ&B... at least in my head. That tuxedo pant is sick! I always love a mix of class and ruggedness. The grey skirt with black leather paneling is fab. The biker gloves paired with the dandy look of the bow tie, dress shirt and double breasted vest is perfection. 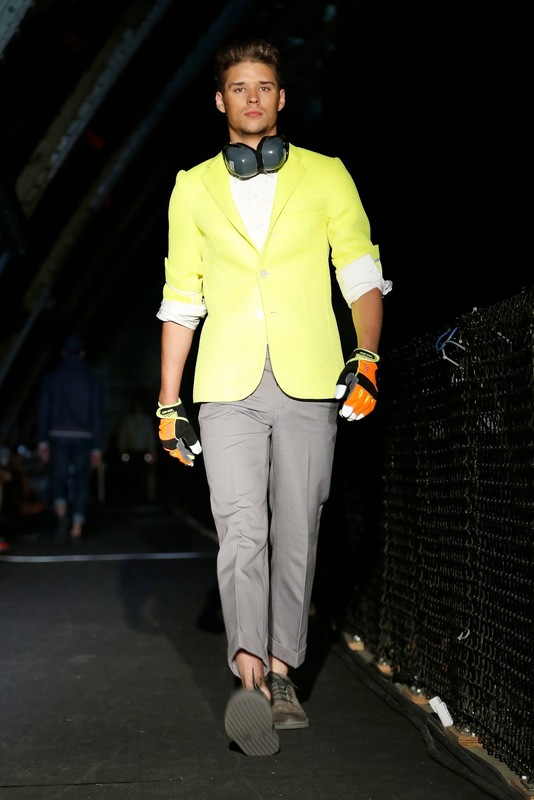 Congratulations to Marlon on an awesome Spring/Summer 2014 collection! Be sure to check out the video below to experience the runway show. The video is edited really well and I am obsessed with the song 'Diamonds & Gold' that was used in the show. SO GOOD! MARLON GOBEL • S/S 2014 Runway Show • "We Built This City" from MARLON GOBEL on Vimeo.